Thousands of organisations use Fireworks to raise funds. Although it may seem overwhelming at first, planning a display is not too difficult. The following advice should be helpful. Whether to have a ‘professional’ display, or choose the DIY option. Where the display is to be held - is there sufficient space? Will there be local displays on the same night, which may affect the attendance? Who will do what? You will need to allocate a firing crew (for DIY displays), stewards, gate monitors etc. Insurance - to what extent are you covered? Think about contacting us to discuss your ideas. We may be able to help. Order your fireworks. 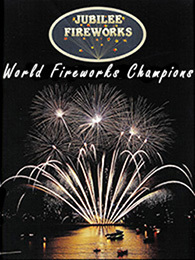 Do a little research regarding the different types of fireworks available before making your final purchase. If you are planning a November show, consider attending Jubilee's training course in September - book a place (or two!). Don't forget that your funds can be boosted by selling glow-novelties such as literope necklaces and sparklers. If you have the facility to sell food at your event - don't miss out on the extra profits that this can generate. If you have the space, why not consider a few 'fun fair' rides (a bouncy castle for example). Advertise your event as widely as possible. Don't leave this too late, otherwise you may find that people will go elsewhere. Posters and leaflets are vital - but local radio stations are usually willing to support community events and will often promote them free of charge. Finalise all admission costs based on your expected attendance. If you are staging a school or community display - what about a running a 'Best Guy' competition - with a prize for the winner! Get local people involved, where you can. Contact all relevant bodies who may need to know about your event - for example, the local authority (who may wish to check your facilities). The firing team should meet to go through the fireworks and familiarise themselves with the various types. Think about drawing up a display plan and firing order. Begin preparations early. Set-up in daylight and ensure that everyone knows what their duties are. The Health and Safety Executive (HSE) have produced a useful booklet Giving Your Own Firework Display HSG124 (ISBN 978071661626) which provides helpful information for school, club and community groups planning a DIY display. You can download a free copy here .